Near the beginning of the 20th century, a shipwreck was discovered. It contained a horde of treasure en route from Greece to Rome, including a life-size bronze head of a philosopher. The most valuable treasure, however, was a 2000-year-old analogue computer believed to have originated on the island of Syracuse. The Antikythera mechanism is a sophisticated arrangement of bronze gears, which can calculate the relative positions of the Sun and Moon, lunar phases and even eclipses. Archaeologists were unable to determine the workings of the computer until the advent of X-ray tomography revealed gears and inscriptions pertaining to astronomical calculations. In 2006, Michael Wright constructed the first reasonably accurate mechanical model of the mechanism, reviving this ancient computer. 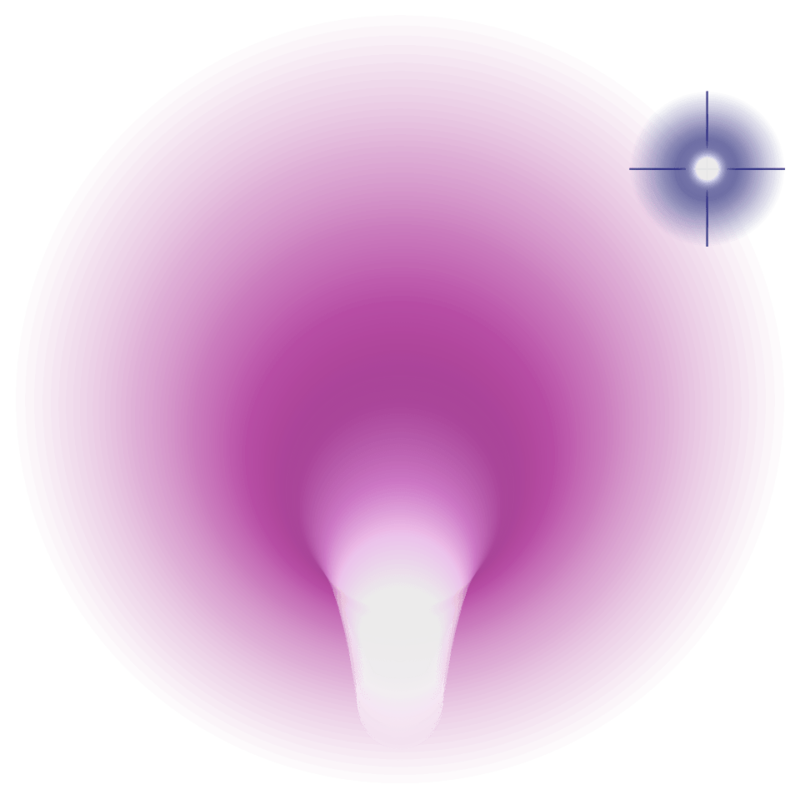 There have been a handful of computer simulations, including the one presented here. 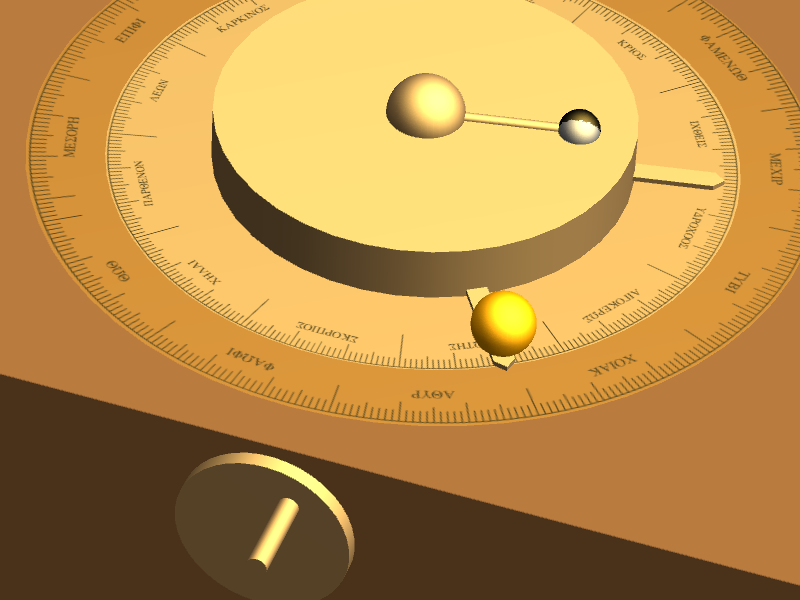 Turning the crank causes the Sun and Moon pointers to move, with the phase of the Moon represented accurately by an embedded semi-silvered sphere. There are two concentric dials: one displaying the tropical zodiac; the other indicating the current date in the Egyptian calendar. The inscriptions are, as expected, in Ancient Greek. Just looking at the outside will not give a very good understanding of how the mechanism actually functions. For this, it is necessary to strip away the enclosure and analyse the arrangement of interconnected gears. The 48-tooth crown gear connected to the crank handle meshes with a large, horizontal 224-tooth gear (the mean sun gear, b1). This completes one revolution per simulated year. As you can see, the central pillar rotates, advancing the position of the Sun needle and globe. Most of the other gears encode rational approximations to astronomical cycles, such as the Exeligmos and Metonic cycles. The 223-tooth gear (e3), for example, is a necessity due to the Saros cycle, which lasts for 223 synodic months. As 223 is a prime number, it cannot be ‘factorised’ into smaller gears. Let’s have a look underneath the mechanism, to see the remaining mechanics. We can see a 188-tooth annular (ring-shaped) gear, e4. This is welded to e3, which lies directly above it (or behind, in this screenshot). Mounted on e3 are two offset gears, which rotate together due to a pin-and-slot connection. The offset means that one of the gears (k2) moves at a non-linear rate with respect to the other (k1), emulating the elliptic orbit of the Moon. This is then transferred back up the central spindle ‘b’ by a network of other gears. I zeroed the device to May 6, 2012, 03:35 GMT, when a full moon and lunar perigee (closest approach to the Earth) occurred merely two minutes apart. According to my calculations, this event only occurs every 1500 years or so. As the moon is travelling fastest at perigee, the pin in the pin-and-slot mechanism is closest to the axes of k2. The period of k1 and k2 is an anomalistic month: the time between successive lunar perigees. The moon pointer rotates with a period of one sidereal month with respect to the fixed stars. 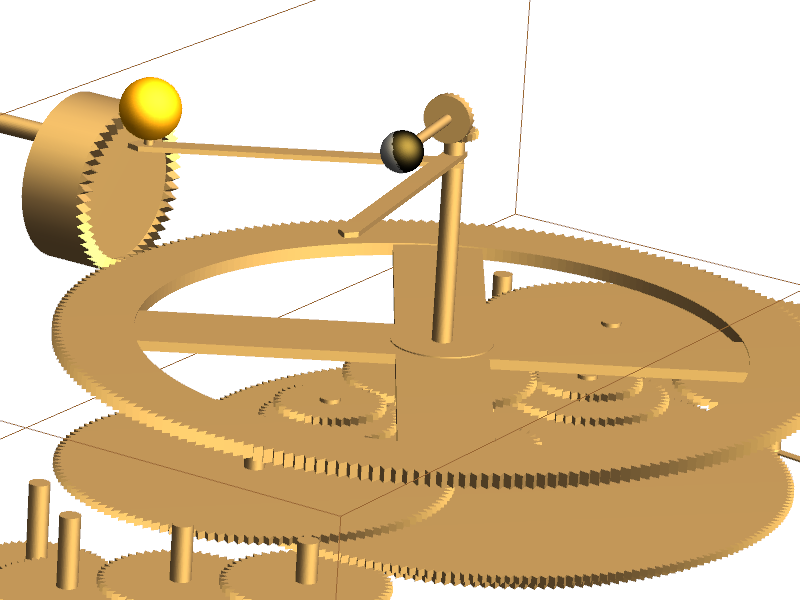 By means of a crown gear mounted on the top of the ‘b’ spindle, the difference between the angular velocities of the sun and moon is determined. The period of this is the synodic month, which is the time between successive full moons. I had some difficulty implementing this, as the Wikipedia article is inaccurate (claiming that there are 12.474, as opposed to 12.368, synodic months per solar year). The crown gear rotates the semi-silvered ball about a horizontal axle to display the current phase of the moon. Another feature of the mechanism is the ability to predict eclipses. This cannot be inferred simply from the orrery on the front of the box, as in reality the orbit of the Moon is not coplanar with the orbit of the Earth around the sun (a plane known as the ecliptic). Hence, eclipse cycles are dependent on a fourth type of lunar month, the time taken for the Moon to return to the ecliptic. This is known as the draconic month. 223 synodic months are approximately equal to 242 draconic months, as we determined with the LLL algorithm. The Saros, Exeligmos and Metonic cycles are all displayed by means of pointers on the rear face of the mechanism. 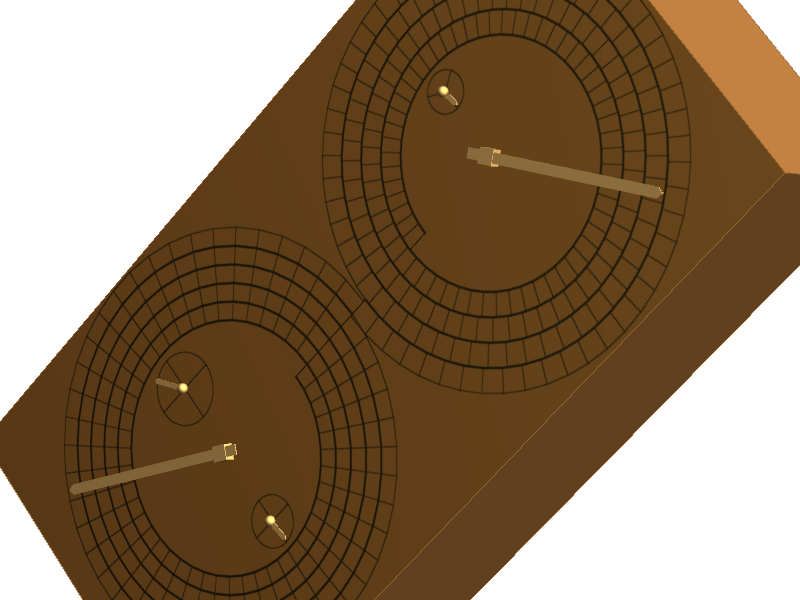 There are additional pointers for the Callippic cycle and calculation of the dates of the Olympic Games, Nemean Games et cetera. 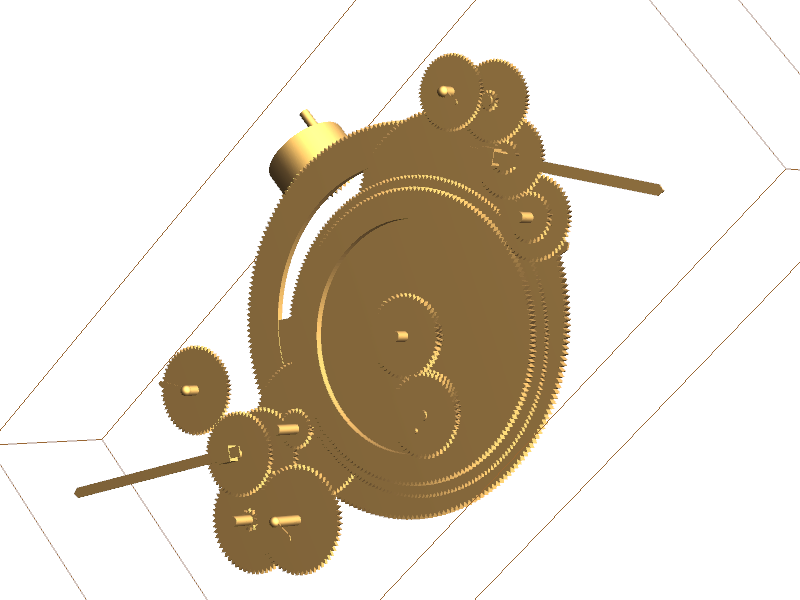 The Metonic and Saros cycles are displayed on Archimedean spirals for greater precision, with a stylus tracking the spiral in a similar fashion to those record players people listened to in the 70s. The Antikythera mechanism originated on Syracuse, which suggests that Archimedes invented a precursor to this analogue computer. This is rather fitting, actually, due to the Archimedean spirals engraved into the posterior plate. I may upload the simulation to the Wolfram Demonstrations Project in the foreseeable future. It’s very complex (several pages of code) and rather slow, though. You can see a couple of my other demonstrations in the meantime. At the moment, I have only accounted for the known mechanism. The large vacuous space above the mean sun gear, together with suggestive inscriptions, hint at the possibility that the mechanism also displayed the positions of the five planets known at that time (namely Mercury, Venus, Mars, Jupiter and Saturn). Unfortunately, we have no idea how this mechanism worked, and there have been three radically different proposals. Great, it’s a nice article. You claim you have zeroed the device on May 6 2012. This gives you fixed points for the phase (full moon) + lunar perigee. That fixes the pin-and-slot positions as described in your text (I believe). However, there is one question remaining: What about the apsidal precession modeled with the larger wheel (where the four 50 toothed gears are attached)?